Neal D. Shore, MD, FACS, summarizes how the Large Urology Group Practice Association (LUGPA) has and continues to preserve and advance the independent practice of urology by healthcare policy advocacy, business and administrative excellence, clinical and therapeutic education, and ensuring the success of future leaders through their Young LUGPA program. 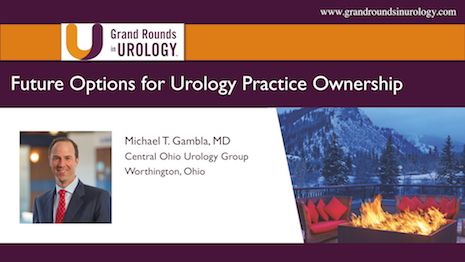 Michael T. Gambla, MD, explains how to navigate the landscape of hospital partnerships and purchases, private equity partnerships and transactions, and large groups consolidating for expansion in the realm of urology. R. Jonathan Henderson, MD, summarizes the Large Urology Group Practice Association’s (LUGPA’s) efforts to develop an alternative payment model (APM) for urologists treating newly diagnosed prostate cancer patients. He explains the roadblocks to reaching this goal, including conflicts with the Physician-Focused Payment Model Technical Advisory Committee (PTAC). The Role of the Young Urologist – What Makes Millennials Tick? Tamra E. Lewis, MD, FACS, defines the term “millennial,” discusses urology practice demographics and work culture trends, and talks about how to recruit and retain young urologists in independent practices. She explains how these shifting attitudes and trends led to the founding of the Young Large Urology Group Practice Association (LUGPA) organization. Evan R. Goldfischer, MD, MBA, FACS, advises urologists on how to optimally and responsibly negotiate hospital contracts under present-day Fair Market Value parameters. He describes negotiating service arrangements, clinical co-management, call coverage, and quality improvement programs. Daniel P. Petrylak, MD, stresses the importance of taking a multidisciplinary approach when treating prostate cancer. Not only does this mean involving urologists, oncologists, and primary care physicians for better access to therapies and coordination of care, but also involving nutritionist, mental health professionals, and pain management experts for maintaining patients’ quality of life. Michael S. Cookson, MD, MMHC, describes how urologists can use American Urological Association (AUA) guidelines to better manage metastatic castration resistant prostate cancer (mCRPC) patients. He stresses the importance of urologists serving as the primary caregiver, the multidisciplinary care model, and organized sequencing of treatments and therapeutics. Leonard G. Gomella, MD, FACS, discusses bone health issues related to prostate cancer, specifically androgen deprivation therapy (ADT) induced osteoporosis, bone resorptive therapies, such as bisphosphonates and denosumab, and morbidity and mortality associated with men who manifest bone-positive metastatic prostate cancer. Scott B. Sellinger, MD, FACS, explains how the constantly evolving Medicare Access and CHIP Reauthorization Act (MACRA) affects Medicare payments to urologists, and how urologists can participate in the Merit-based Incentive Payment System (MIPS). 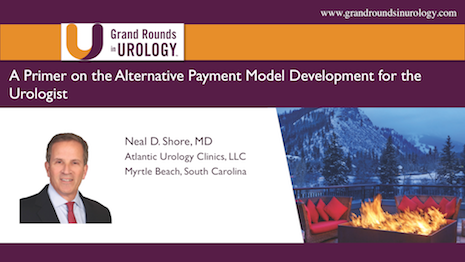 He also discusses the Large Urology Group Practice Association’s (LUGPA’s) efforts to develop urology-specific advanced alternative payment models (AMPs). Philip J. Koo, MD, describes the mechanism of action of Radium-223 in prostate cancer treatment, options for combining and layering Radium-223 with other drugs, and how the field of radiation is evolving. He also addresses the controversial ERA 223 trial results. Robert E. Reiter, MD, summarizes the impact advanced imaging techniques have had on staging and managing prostate cancer in the past few years. He discusses state-of-the-art molecular imaging, particularly focusing on prostate-specific membrane antigen (PSMA) targeted imaging.